As far as I can tell, the French prog scene of the 1970s was composed of Magma, Heldon, and people that played with Magma, Heldon, or both. Richard Pinhas' (and I thought my pseudonym was awesome!) Heldon is by far the more accessible of these two groups and I love damn near everything he ever recorded, but Magma's excellence should not be overlooked by the more adventurous. 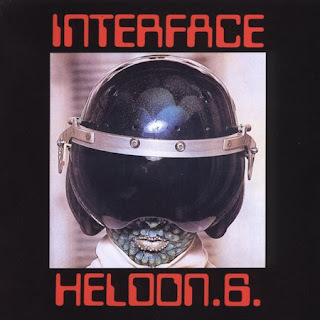 'Interface' was Heldon's sixth record, marking somewhat of a turning point in their sound. The King Crimson influence was still heavy on Pinhas' brain, but he started to incorporate a more rhythm heavy, drums/big moog bass sound to accompanyh his Robert Fripp-like guitar work. This may not be the most user-friendly release in the Heldon/Pinhas catalog, but it is certainly one of the most rewarding and a great starting point for the uninitiated. excellent. I look forward to this. too much jamming for my tastes. mister pinhas is brilliant. good call. And the Heldon album Electronique Guerilla is a nice listen. Another band to check is Pulsar (http://www.thepulsarband.com) who've been going for about 30 years now.